Kali yuga, the age of quarrel and hypocrisy is drowning in irreligion and atheistic lifestyles. And so in this age, Krishna was predicted to decent as the Golden Avatar(incarnation) – Sri Chaitanya Mahaprabhu and establish the Yuga Dharma of Harinaam Sankirtan – Congregational devotional chanting (prescribed method of liberation according to the current age). Sri Caitanya Mahaprabhu appeared in 1486 in Navadvipa, Mayapur in West Bengal to Jagannatha Misra and Sacidevi. He was named Vishvambhara (support of the universe) and nicknamed Nimai, as He had been born under a neem tree. His appearance was accompanied by widespread chanting of ‘Hari Hari’ and as a child, the only way His parents could get Him to stop crying was by chanting the holy names of the Lord. Therefore, from the beginning, He induced people to chant the names of God. 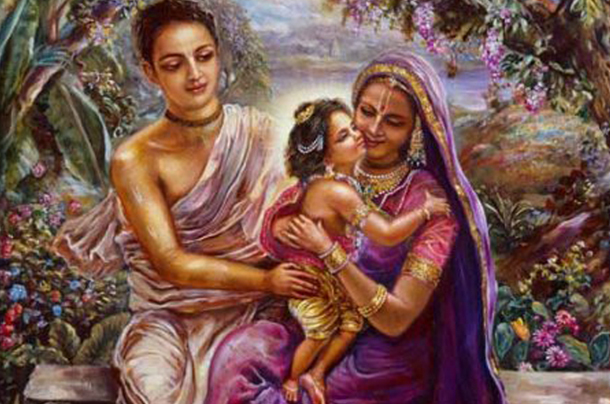 His birth chart was so auspicious that the child was declared as the Supreme Lord, Narayana Himself. It was predicted that He would have extraordinary qualities and would deliver the people of the world with even atheists worshipping him at his feet. 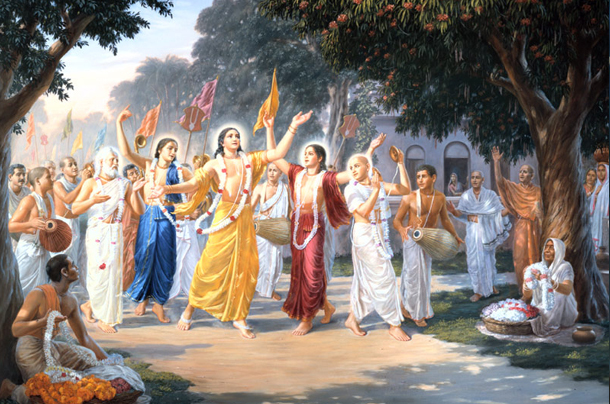 Gaura Purnima is the festival which celebrates Sri Chaitanya’s appearance. It means “Golden Full Moon”. His devotees spend this festival fasting and chanting the holy names. At moonrise a sumptuous vegetarian feast is offered to the Lord and then enjoyed by all. The Supreme Personality, Janardana, who is the object of the yogis’ meditation, who saves the devotees from various sufferings, and who is the master of all yogic practices, who is always full of divine transcendental ecstasy and bliss, will advent in His own divine form of Sri Chaitanya. Hare Krishna, Hare Krishna, Krishna Krishna, Hare Hare, Hare Rama, Hare Rama, Rama Rama, Hare Hare. Previously chanting was done quietly and individually. Sri Chaitanya mahaprabhu along with his associates encouraged loud public chanting and graceful dancing with instruments. The intention was for all the devotees, atheists and even the animals and all living entities, to hear and benefit from the transcendental sound vibrations of the Hare Krishna Mahamantra. Another reason for Sri Chaitanyas appearance is part of the divine Lila or story of Sri Radha Krishna’s pastimes Sri Krishna wanted to feel first hand the devotion which Radharani feels for Krishna and so He came as a devotee in the mood of Radharani expressing Krishna Prem. In this way Krishna can understand Her devotional love for Him.